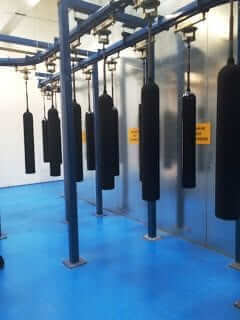 BOC in Wolverhampton have replaced their old wet paint system with a new automated powder coating system. The plant incorporates automated conveyor load and unload, together with online shotblast and powder application booth supplied by Reid Engineering and Gema UK respectively. The TD conveyor system and 2 zone powder curing oven is controlled via a Siemens PLC system and integrates with the controls on the other equipment.